Nothing is as blissful as the feeling of getting married. While you are contemplating your future life with your partner, there is a wedding waiting to be planned! It is no secret that weddings cost a lot of money. Fortunately, there are ways to get around this hurdle. Your wedding day should be one of the happiest days of your life, and it should be memorable. This doesn’t mean that you have to have an extravagant wedding you can’t afford. Sometimes, all you need are smart planning, a workable budget, and the willingness to compromise for the next best thing when your first choice for anything wedding-related is too high priced. Keeping the guest list short can really ease the burden on your budget. If you’re getting catering services for your food, you know that the cost per plate can get expensive, so inviting fewer people means having fewer mouths to feed. When you have fewer guests, you also cut back the costs on other expenses as well. It’s your wedding, and you are not obligated to invite every coworker or every friend you know. Don’t feel bad about not inviting friends you haven’t spoken in the last three years or the people you know from your old job. Make the day more special and intimate by having only the ones who matter attend your special day. Another tip to limiting your guest list is by being firm about plus-ones. When you send out your RSVP and wedding invites, make sure that you only offer the plus-one option to family and friends who are married, engaged, or in a long committed relationship. However, remember that your bridesmaids and everyone in the entourage should be extended this courtesy with no exception. Popular wedding venues tend to get booked quickly, and they can get expensive especially if there are a lot of people vying for the same place. The venue is perhaps one of the most important aspects of a wedding because it sets the atmosphere of the event. Therefore, it is important to find a location that can accommodate everything you need while staying within your budget. If you’re serious about cutting costs for the wedding, instead of going for mainstream reception halls in your area, go for free or low-cost wedding venues instead. If you have a big-enough house or know family or close friends who do, consider asking to use it instead for an intimate house party. Extra money can be saved when guests from far away are housed in the same place. Remember to put out a call among family and friends to see if any of them are willing to have their extra place used for the event. You can also consider other venues, such as a school campus or the function hall at the place where you work. Employees often get discounts in parks, universities, and more. Don’t be shy to ask; they may be able to make that arrangement for you on your special day. Additionally, you can save even more money, time, and effort by having both the ceremony and reception in the same place. If you plan to have your wedding and or venue outside, make sure to check the weather and have emergency tents as backup just in case. Professionally made cakes made of fondant and layered in tiers look so good in photos and in real life, but the downside is, they are quite expensive. If your budget allows it, go for it by all means. However, if you find yourself sighing wistfully at having to forgo it because you lack resources, don’t worry because there is hope! There is a “fake” cake trend in the wedding industry, and brides and grooms are going gaga over it. These creations are considered a practical alternative because, while they may look great in photos and in real life, only a handful of the tiers are edible while the rest are made with Styrofoam. There are a lot of advantages in using faux wedding cakes, apart from saving on the costs. For one, they’re not as heavy as real tiered cakes are, so transport is relatively easier and lighter. Two, they offer a luxurious design and feel without being wasteful. You can also ask around your local baking community if there are people who accept commissions. If you’re okay with bakers in training making your cake, there may be bargain talents around you area who would be willing to make creations to add to their portfolio for a fraction of the price. Remember that you don’t have to have a wedding cake if you absolutely don’t feel up for it. You can go for alternate options instead, like a homemade dessert bar or mini pies. Flowers on their own are cheap, but the expertise and the labor to arrange them are what make them expensive. Flowers are a mainstay at weddings, so it is understandable for brides to want them. If you want to have flowers in your wedding but have to stay in budget, talk with your florist about concentrating the florals in bridal bouquets and groom’s boutonnieres. 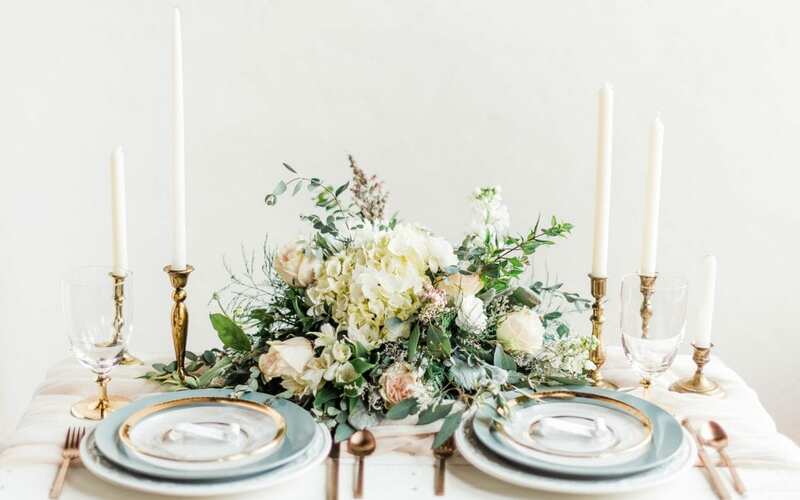 Instead of putting flowers in table centerpieces and other decors, go for alternatives like candelabras, seashell displays, tea candles, and more. Some good and long-lasting alternatives for real blooms are high-quality silk flowers, paper flowers, and greens. If you want to skip flowers altogether, opt instead for other alternatives that can be carried down the aisle. Depending on the theme of your wedding, your bridal party can choose to carry these, among many others: feather bouquet, lanterns, origami cranes, mason jars with candles, or paper flower wreaths. The many designs you can come up with are endless! Stationery may seem like a small thing, but little costs do add up. Custom-printed invitations may look attractive as you hand them out to friends and family, but let’s face it—most of them will not notice the extra ink or fancy edges you put in that cost you a buck or two per invite. Allocate your budget wisely by skipping custom-printed wedding cards by using invitation software instead. Design your invites in a way that they can be printed on a single sheet instead of two or three. This way, you can save on paper, save the environment, and save money. Another idea is to take advantage of the current technology available today. Instead of giving out physical save-the-date cards, use email and social-media announcements instead. They can choose to email back for RSVP invites or even text you. You have family and friends and the bridal party for a reason. Allow them to participate in preparing for your special day. Delegate portions of your responsibilities to others. Creating a support group and leaning on them, as they are willing, will help you get through this wedding-preparation journey. Don’t worry, you can take note of a few great bridesmaids and groomsmen gift ideas and send it to them as tokens of appreciation later on. Your wedding day will be here before you know it. Remember to enjoy your journey and make sweet memories along the way. When that moment comes, make sure to stand together, breathe deeply, and say “I do” without stress and worry. By taking note of budgeting tips and spending money wisely, everything should fall into place. With everything smartly taken care of, go forth and celebrate love.